Okay fine. 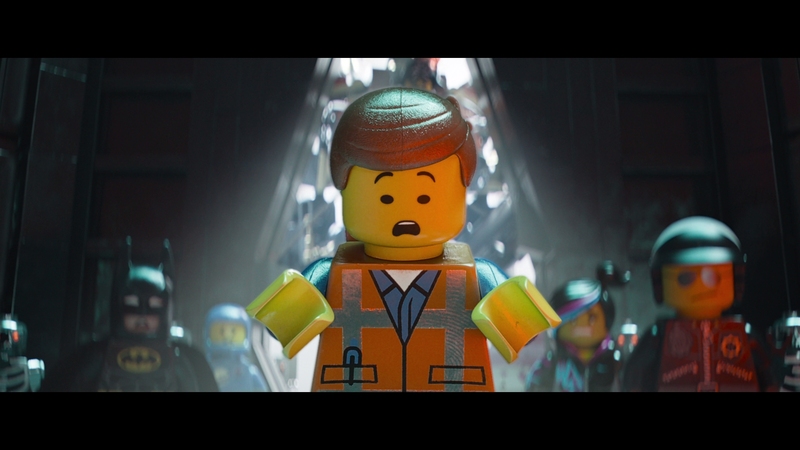 The Lego Movie is a giant, swirling pit of hyperactive hypocrisy. Not only have we accepted product placement as part of the filmmaking process, we have now embraced the idea of crating entire movies around a company’s output. Psychologists will perform mind melds to figure out how we arrived here. The rest realize how everything is awesome. Sure, we’re under some form of distressing corporate control to believe we’re not being swindled, but still. It’s awesome. 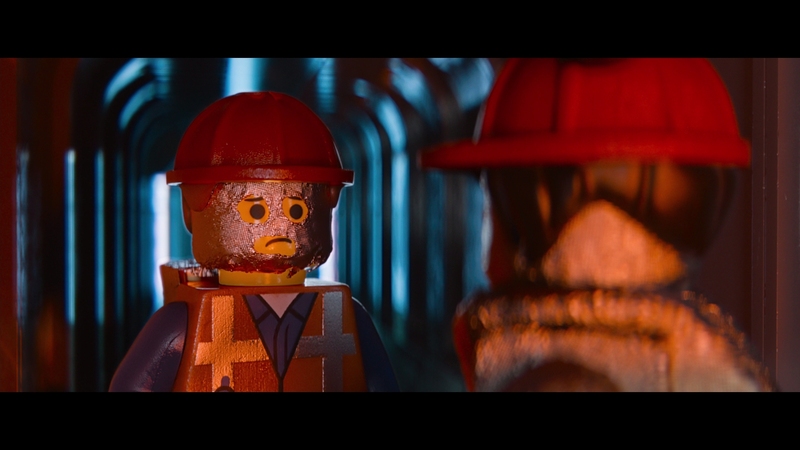 Lego Movie is inexplicably genius. 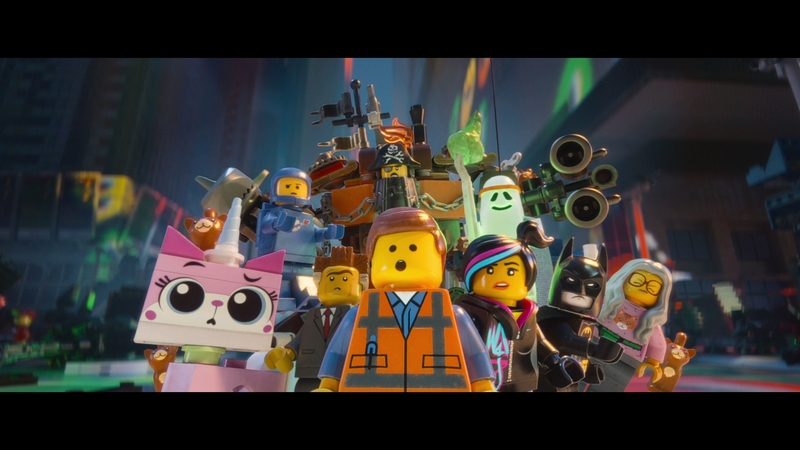 Writers/Directors Phil Lord and Christoper Miller engage their comedic centers to rise above preconceptions over what this should be and instead bleed ingenuity and breathless creativity to construct a story of building a personality of your own – even if you’re a plastic brick. 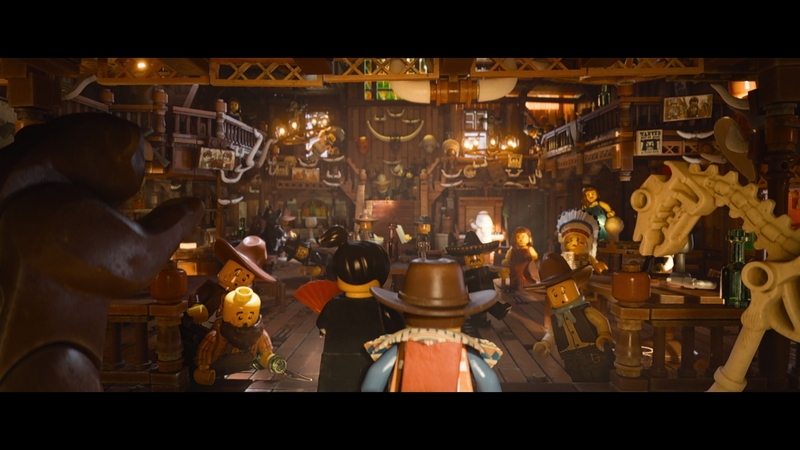 It harnesses the playability of Legos themselves from within the sedentary act of watching a film. 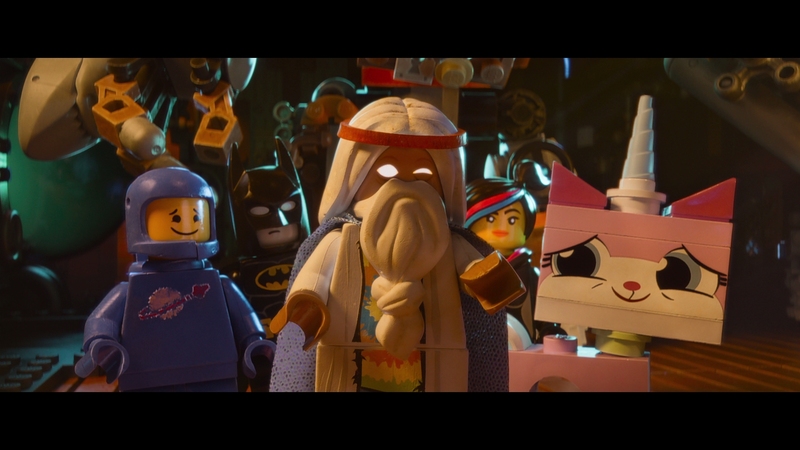 Splurging in licensing (even outside of Warner Bros. ownership) allows this semi-pop culture parody to soar, much as the Lego video games have been doing for a decade or more. 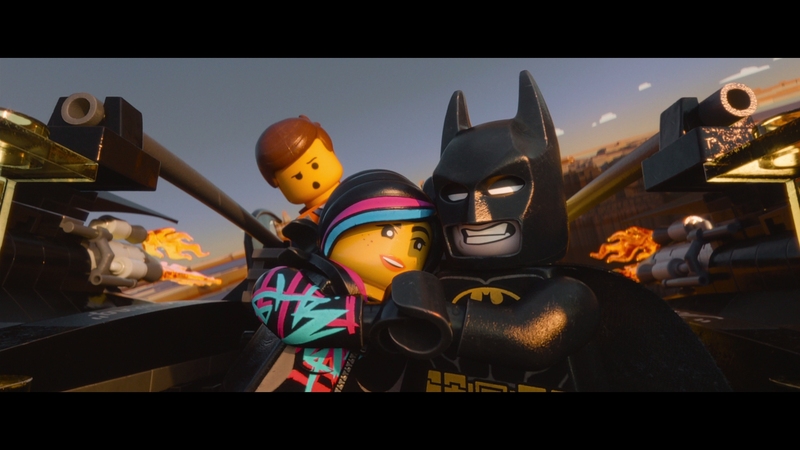 Lego Movie is infused with cleverness and a sharp, excitable wit which is too infectious not to work. Chris Pratt’s turn as the lovably doltish Emmet Brickowski anchors the piece in enough comedic punch to carry a typical good versus evil run – at least until it’s not. 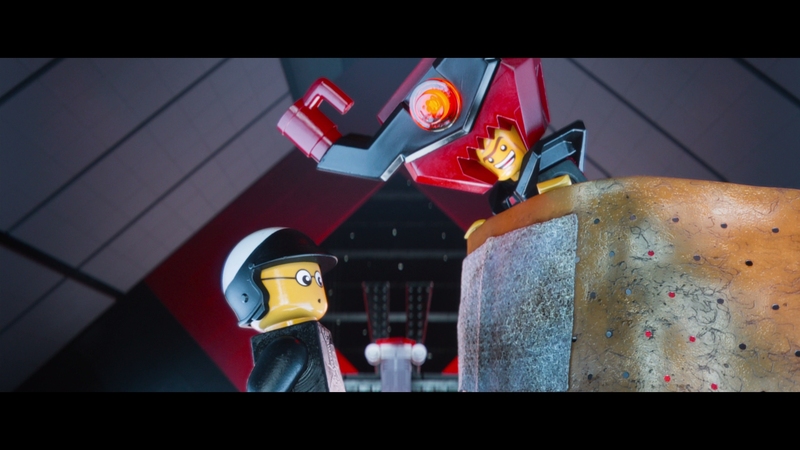 The tender and even sweet side given to Lego Movie in its final act stamps a layer of near perfectionism on the idea, even justification for those who may wince at marketing or as some called out, the anti-profit mongering depicted in its villainy. So be it. Sometimes it’s not about the profit (unless you’re Warner Bros.’ top brass who are swimming in $200 million of domestic gross), but the shared moments building or remembering. 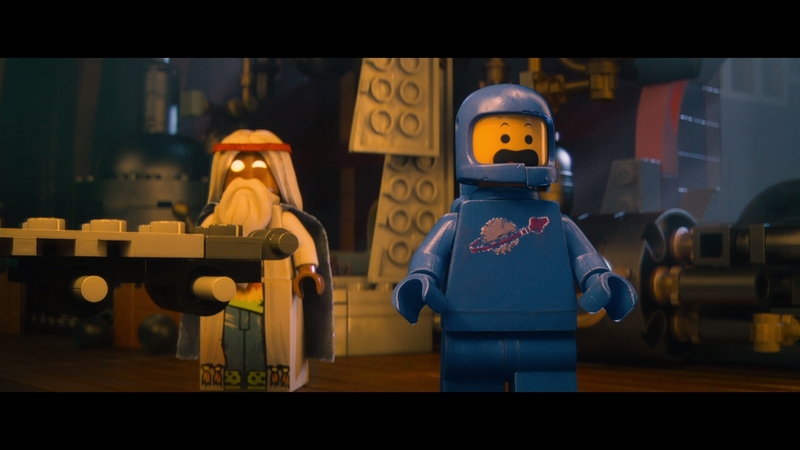 Lego, and in turn The Lego Movie, has a lot of those moments. Stupendous animation is at the heart of this technical beast which may carry the appearance of a high gloss, stop motion production, but instead exists only in the mind of a hard drive. Texture work captures the scrapes and scars of pressed plastic as often as it does virtual fingerprints from tireless animators. Warner’s Blu-ray is reliable enough to grab at those miniature visual bonuses and present them with the fidelity of any other CG offering on the format. 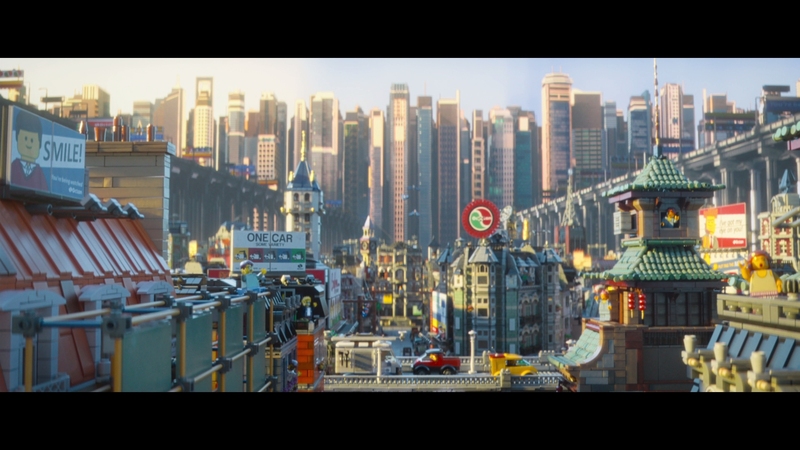 Long shots, whether of hundreds of Lego people or cities, are astonishing in how much detail is carved into the available resolution. Sizable color saturation pours out streams of primary hues, with each change in locale during the adventure offering a new selection of intensity. A splendid dusty facade greets the Western stage, and a city built on clouds appears as if a rainbow fell over the scenery during its creation. 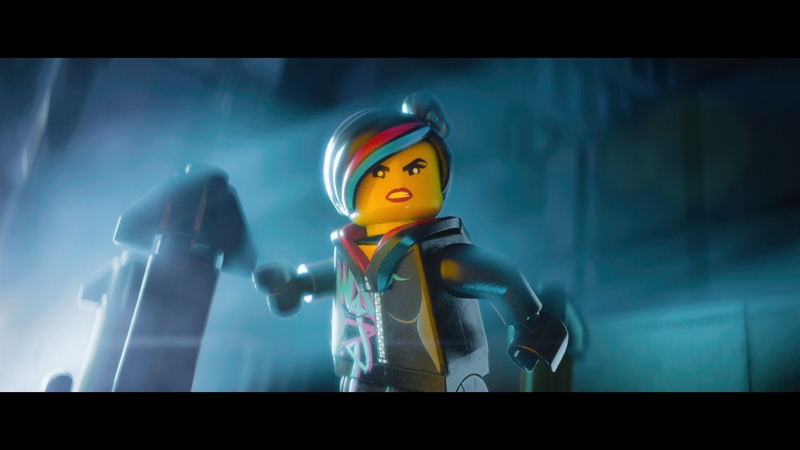 Each character design sides with specific patterns, from Emmet’s orange construction suit to WyldStyle’s (Elizabeth Banks) dual neon striping. This is all backed by insane depth, which is the duality of dense highlights and powerful black levels. Opening shots split between both, found inside of a carved out lava flow where heated oranges scatter light and recesses appear deep. A nighttime chase through the streets can stand amongst the pinnacle of black level reproduction on the format. Some live action provides the only grievances, although hefty intentional filtering allows a dream like visual stance to take over. Heightened detail was not a priority when pushing these scenes through post. Expectt a drop in overall texture with no impact on overall quality. Warner’s disc further soars in 3D, although the studio’s release is somewhat questionably (and even confusingly) held inside of an oversized plastic box with needless trinkets. There are no other means to purchase the 3D disc at this time, although this may change into the future. 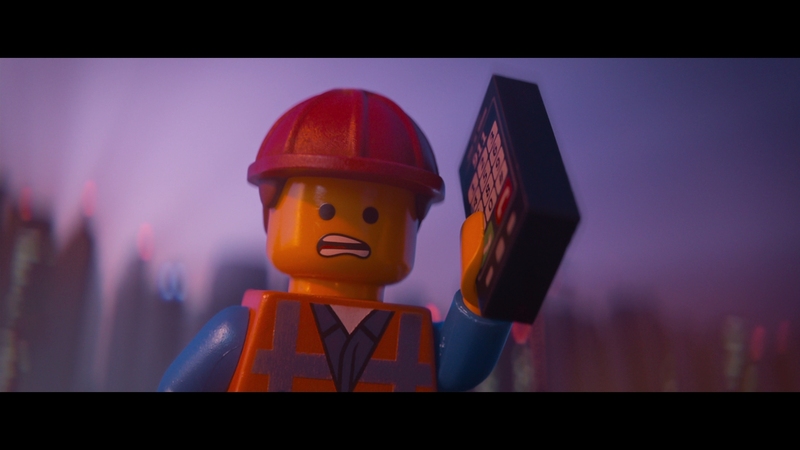 Either way, this is essential 3D, and Lego Movie was clearly designed for exploitation of the tech. Lasers whip directly into the lens, characters poke at things, and falling sequences are rather plentiful in creating full dimensional space. Thought most of this feature is created with action, those “lesser” scenes remain competent. 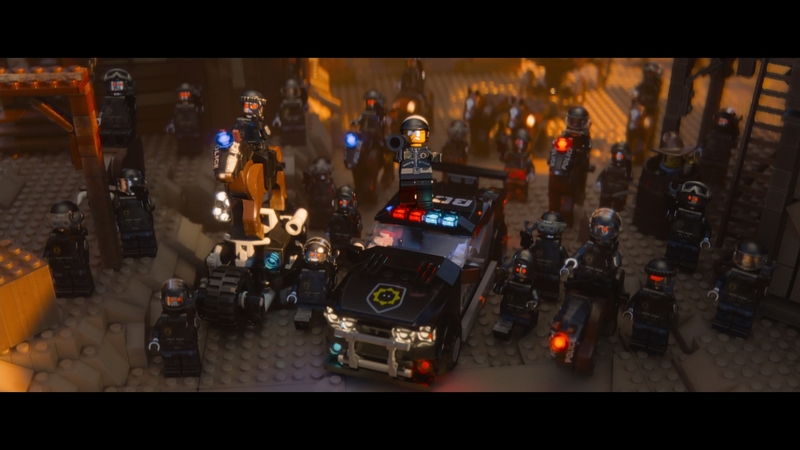 Lego civilians and main characters feel rounded or blocky as needed. Helmets or other items appear with defined separation from the face, those small details which enhance a 3D presentation, nailing why this format works. Continuing a stream of awesomeness is an audio mix with plenty to do, and shows no fear when seeping into stereos. Sound travels with any action or small moment, whether it needs voices or sound effects. Bad Cop (Liam Neeson) kicks an object between the fronts from right to left as the speakers pick up on the movement. Chase scenes or other action sweeps the soundfield, carrying engines or laser fire in appropriate channels. Movement is flawlessly stretched and distinctive enough not to be lost under heavy fire. 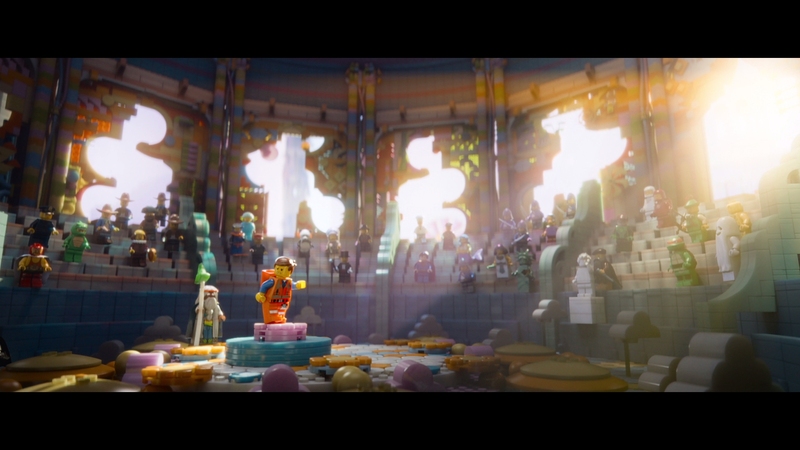 Some of the quieter moments are impressive too, including swirling voices as Emmet thinks deeply around 35-minutes. Prepare the subwoofer for beefy explosions which add weight to this lightly plastic world. LFE application is tight and broad, used frequently to enhance vehicle pans or slam on the “Everything is Awesome” theme song. The electronic beat is loud. Phil Lord and Christoper Miller join part of the cast (Will Arnett, Chris Pratt, Alisson Brie, and Charie Day) for a commentary track often suffocated by mild chatter instead of information delivery. It’s entertaining, but superfluous. 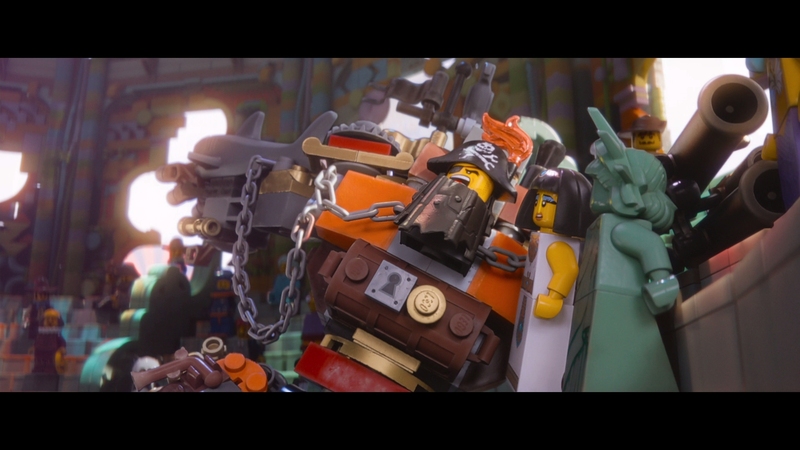 A few shorts include Batman’s music video, a parody trailer for Michelangelo and Lincoln: History Cops, and semi-teaser for Ninjago. 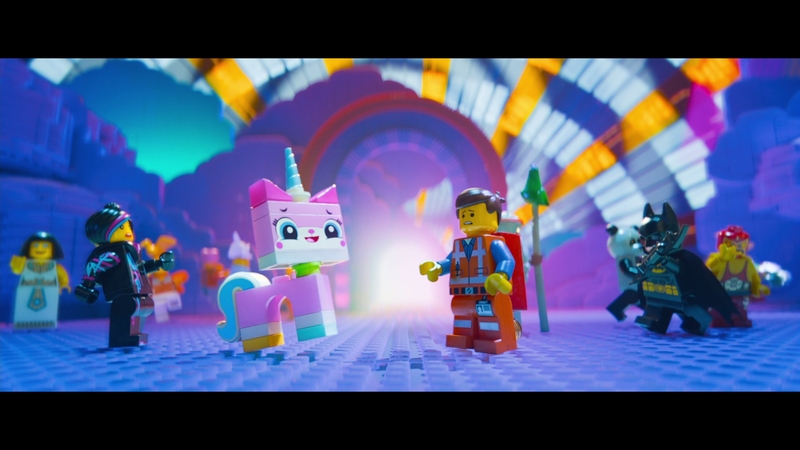 An “Everything is Awesome” sing-a-long is necessary because everything is awesome (sorry), and some outtakes appear formed around actual actor chatter between takes. 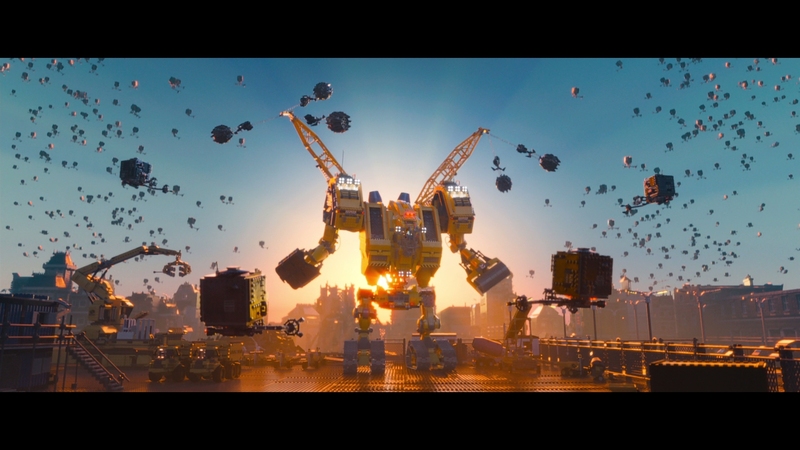 Bringing Lego to Life is a featurette on the design process and technical challenges, enjoyable if fluffy. 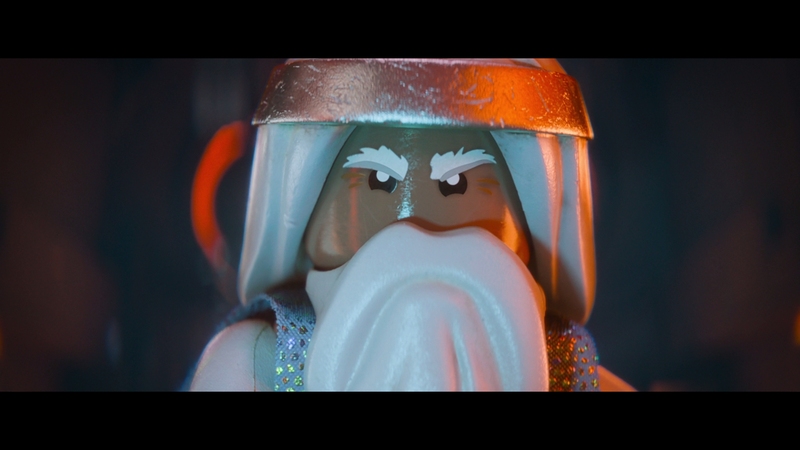 Far more interesting is Meet the Lego Builders, which showcases the talents of real life Master Builders as they perform their work for the feature. 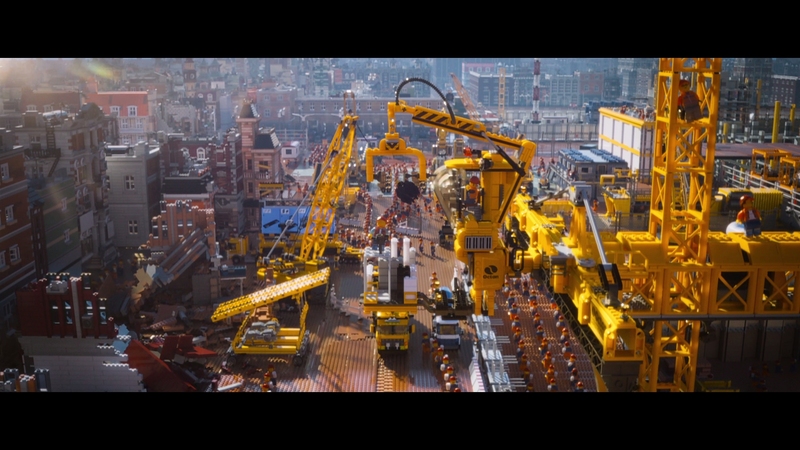 See It, Build It is a section split into six parts which hones in on character designs, while some fan made films made for a competition are shown in full. Stories from the Storyteam is audio driven while adding a unique personal touch. Finally, Warner shows a brief one minute clip which was proof-of-concept and some promo content. There is a lot to take in, some of it meandering, but the majority holds to the spirit of the movie. Click on the images below for full resolution screen captures taken directly from the Blu-ray. Images have not been altered in any way during the process.